A Vehicle Identification Number, also known as a VIN, is a 17 digit alpha numeric code that vehicle manufacturers use to describe the make, model and design features of a vehicle. 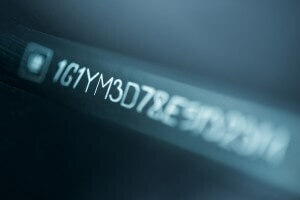 There are dozens upon dozens of detail that can be gleaned from a Vehicle Identification Number Search. You can even find license plate number and owner information. There are a couple ways to lookup a Vehicle Identification Number. The first, and antiquated method, is to visit the DMV and request a VIN Number Search. This means that you’ll have to have to visit the DMV in person, take a number, wait in line and then hope that you have all the relevant information when you finally make it to the window. The second method to looking up a VIN number is to find an online VIN Decoder. There are a multitude of free VIN Decoders out there but very few will also give you access to driving records, owner information, recall and safety data and license plate information. With our resource you can quickly access over 2 billion records in just seconds. The best part about looking up Vehicle Identification Numbers online is you can do this from the convenience of your home or anywhere. With our premium databases you can quickly access a multitude of vehicle records without having to visit the DMV. You can lookup driving and vehicle records by name, license plate or VIN number. All our vehicle database records are updated daily so you can rest assured that our information is accurate. If you’re interested in signing up with our premium membership, we offer a 5 day trial for $2.95 where you can test drive our resources before committing. I have been looking for the first car I owned before I went in the Army back in 1970. I still have the original bill of sale with the vin on it. Its a 1966 2door hard top Chevy SS Cheville. Problem is they ask for 17 digits. my vin is only 13 digits. Do I need to add the year 1966 to it at the end or the beginning or what number are I missing. I’d really like to find the owner and see if they’d be interested in selling it. If not I would love to know if it still around. Unfortunately we will need a 17 digit VIN number to perform a vehicle search. If you have the license plate number we might be able to locate the vehicle information that way. Unfortunately we do not have this information in our database. One possibility is the VIN number we ran in incomplete. We can only lookup vehicle records with VIN numbers that are 17 digits. If the vehicle has never been registered in Manitoba then you will probably have to go through the DMV or contact the owner directly to obtain more information. Check out our Free DMV Finder to locate your local DMV for more information on how to proceed. If you discussed this with the DMV then unfortunately that is probably the case if you’re looking to apply for a duplicate title. Do you have the license plate number or VIN number that we can try and assist you with your search? We will also need the state of registration. There are no guarantees but we might be able to locate some additional information for you. You can typically find the VIN number on the engine as well as the dashboard and on the frame of the vehicle on the inside of the door. These should all match up. You might consider taking your Volkswagen to a certified dealership to have them verify this information as it can be difficult to assess if transmission, ECU, ABS and throttle body have been altered or replaced since these components do not have the VIN numbers printed on them. There are typically 3 places where you can find the VIN Number on your Car. Is there a specific question about the VIN number that we can assist you with? I have paid my search fee for the information I am looking for but it was not immediately available. I was told that they were going to update and let me know later. But every time I check they ask for another $2.95. So, what is going on? Sorry about the inconvenience. I have forwarded your a request to customer support to refund you. That being said we can certainly assist you here. What information are you looking for. A VIN number check? or another public record?